A few months ago, I had the privilege of seeing The Matrix (1999) on the big screen. I missed its theatrical debut fourteen years ago, but my local cinema occasionally plays older movies in special screening events. The Matrix was already one of my favorite films, so I jumped at the chance to see it in theaters. The experience was nothing short of revelatory. Only sitting in a theater did I understand the purpose of the film’s wide 2.35:1 aspect ratio. As my head turned to keep up with a back-and-forth between Neo and Morpheus, I became cognizant of how deliberately cinematographer Bill Pope framed every shot in the film. No matter how many times I’d watched The Matrix on Blu-ray, nothing compared to this. At that moment, it was clear: this was how the movie was meant to be seen. Like many cinephiles, I have always seen value in physically going to the movies. For me, this offers unparalleled spectacle. There is something unique and attractive about sitting in a darkened room alongside a hundred mysterious faces. For a brief few hours, you and your stranger compatriots stare at an enormous screen, and together you let the movie flood your collective imagination. Some movies demand to be seen like this. They tend to be big budget productions featuring excess computer generated imagery. The Wachowskis’ The Matrix is one of those films, as was Zack Snyder’s gorgeous 300 (2006). This year, audiences were given a wide swathe of blockbuster choices. Pacific Rim offered titanic kaiju fights, The Great Gatsby put wealth on lavish display, and Iron Man 3 and Thor: The Dark World reveled in bombastic superhero heroics. However, two movies particularly thrived the cinematic environment: Alfonso Cuarón’s science fiction epic, Gravity, and Peter Jackson’s The Hobbit: The Desolation of Smaug. Using unprecedented filming techniques and the bleeding edge of special effects, Cuarón defies the laws of physics in his latest effort. Gravity opens with a dynamic 13-minute long take just outside of Earth’s atmosphere. In this shot, the “camera” itself orbits the two main characters; this immediately engages the audience spatially within the diagetic universe of Gravity. The film is filled with exhilarating big screen moments like this, all of which compound to provide a one-of-a-kind virtual trip through the cosmos. Peter Jackson also gives audiences reason to get off the couch and head to the theater. In his most recent film, The Hobbit: The Desolation of Smaug, Jackson employs high frame rate footage to increase the fidelity of 3D. Most home entertainment centers can’t replicate this new technology just yet, so seeing The Hobbit films in theaters offers a unique opportunity. Interestingly, the common element between these two films is 3D, itself a relatively new addition to modern cinema. Opinions on the format vary wildly. For some, 3D offers nothing more than a darkened screen and a splitting headache. However, viewers who can stomach those shortcomings often find the added dimensionality produces a more immersive experience. I myself am not a huge proponent of 3D. Nevertheless, I would make exception for both The Hobbit films and for Gravity. As I mentioned in my article on HFR, 3D looks markedly better at 48 frames per second (and even better at 120 frames per second). Characters and objects seem have a true z-axis that eschews the South Park-esque collage look of other 3D movies. 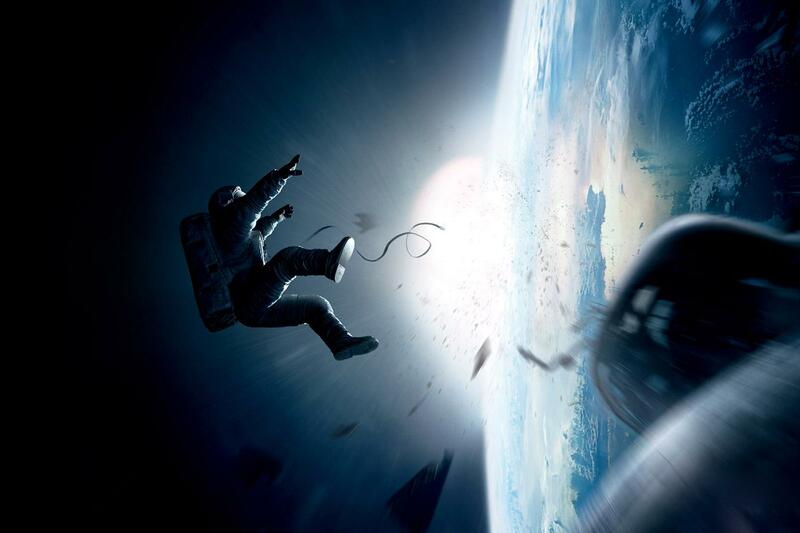 In Gravity, Cuarón takes care to use the third dimension at key moments. After feeling the open void of space for minutes on end, pieces of space debris appear abruptly and clutter the screen. As hunks of metal hurtle at the camera the effect is jarring. I am embarrassed to say I even found myself ducking in one such sequence; Cuarón and his team successfully tricked me into forgetting it was all a façade. It is moments like that which hearken back to the early days of cinema. I am reminded of an 1896 movie review, wherein Maxim Gorky describes one of the first silent films as a “Kingdom of Shadows.” In that piece, he says of black and white movies, “it is not life but shadow, it is not motion but its soundless spectre.” At the turn of the last century, these wonderful filmic moments were priceless novelties. First it was the magic of seeing a picture leap forward in motion, and then it was hearing them talk. Later, it was seeing film come alive with color. These cinematic advances gave viewers a passing glimpse at intangibly fantastic worlds. They endeavored to give audiences temporary residence in alternate universes. Today, new technologies continue to compel audiences to return to the theater. With filmmakers like Peter Jackson and Alfonso Cuarón toeing the boundaries of technological immersion, perhaps we can find time to stay in these magical worlds just a little bit longer.